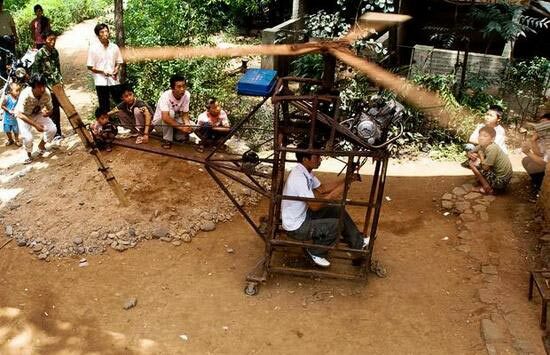 This wooden helicopter was apparently built entirely by Wu Zhongyuan in China. He used about $1,600 in assorted parts (like a motorcycle engine) and steel pipes for reinforcement. He figured out how to do it with "relevant knowledge [found while] surfing the Internet via my mobile phone." He claims that this single-seat helicopter has the ability to fly as high as 2,600 feet - but the Chinese government has grounded him for the time being, due to safety considerations. This homemade device reminds me of the helicops from John W. Campbell's 1930 novel The Black Star Passes and Robert Heinlein's copter harness from his 1954 novel The Star Beast. Campbell and Heinlein both popularized and reflected the many do-it-yourself efforts to create a personal flying machine (or a groundcar) in the early years of the twentieth century.